With a plethora of services designed to render your stay as enjoyable as possible, Athena Villa 3 offers an absolute haven of peace and serenity to help you recharge your batteries as you relax in utter bliss. Boasting a high level of intimacy and privacy, Athena Villa 3 has been completely set up to help guests forget the hustle and bustle of their everyday lives. Featuring the perfect setting for some much-needed escapism, this villa is additionally known for its vibrant greenery and lush flowery garden. 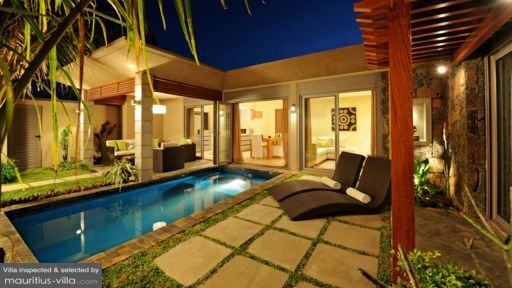 This villa can accommodate a maximum of 7 guests. It is equipped with a spacious Master Bedroom that comes with a private dressing area as well as a safe. In the Master Bedroom, you will also find an en-suite bathroom with shower, toilet and various other bathroom amenities. This bedroom also comes with a spacious bed. The Master Bedroom overlooks the private garden, which means that you will be able to drift off to sleep lulled by the sweet scent of tropical flowers. It opens on the pool area. The guest bedrooms at Athena Villa 3 come with double beds. These two guest bedrooms share a bathroom between them. All the bedrooms have been fitted with air conditioners to help you beat the typical Mauritian heat. One of the guest bedrooms overlooks a small green area while the other opens directly on the living area. Not unlike the master bathroom, the guest bathroom is also equipped with a shower, sink, toilet and mirror. At Athena Villa 3, everything has been conceived to help you enjoy the tropical outdoors. The massive back garden has been fitted with a deep pool where you can work on your laps or simply float on your back as you look up at the starry night. Additionally, the veranda comes with a comfortable set of outdoors furniture as well as barbecue equipment and facilities, which is ideal for a fun night out with friends. 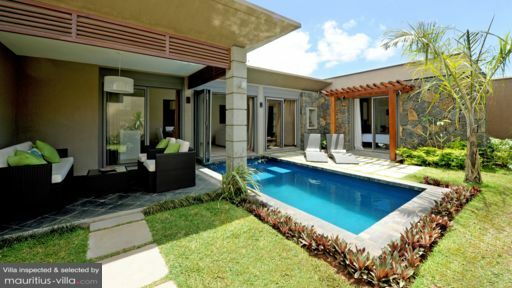 Best of all, the private garden also comes with sun beds, enabling you to soak in the glorious Mauritian sun. The 2.6m x 4.95 m pool is fully illuminated at night. Athena Villa 3 comes with a spacious and airy living area which includes an L-shaped sofa, a coffee table as well as a large flat-screen television. In the living area, you will also find a dining table that can seat 8 as well as a furnished kitchen that comes complete with all its amenities and utensils. The kitchen overlooks a small green space while the dining and living area open in the pool. The back entrance to the private parking lot can also be accessed through the dining area. Athena Villa 3 offers a wide range of services to ensure that you have a completely comfortable and luxurious stay. For instance, you will have a complimentary maid service to ensure that the cleaning up is being taken care of while you make the most out of your holiday with your friends or family. Every morning, the maid will be pleased to bring you a full breakfast hamper bursting with pastries, fruit juices, tea, coffee, bread and jam. For an added fee, you can also add sausages, bacon and eggs to your hamper and the maid will gladly whip you up a scrumptious English breakfast in the kitchen. If you want to enjoy your holiday without having to worry about cooking, Athena Villa can also put a trained and highly experienced chef at your disposal, for an added supplement. Additional services include babysitting, grocery delivery, car rental, airport transfer and the likes. 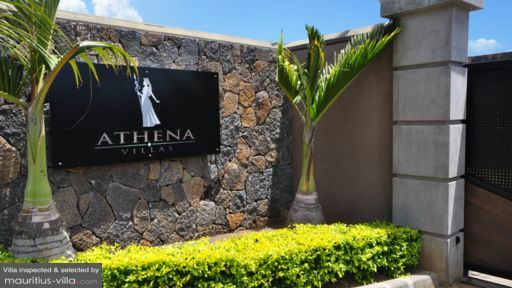 Because of its proximity to the tourist hub of Grand Bay, Athena Villa 3 offers you the chance to explore some of the best spots in Mauritius. If you want to try your luck at gambling, for example, you can check out the island’s most prestigious casinos- Senator Club and Casino de Maurice- which are a mere thirty minutes away from the villa. As far as the beach is concerned, guests of the villa have an exclusive access to La Plage, a private sun-kissed stretch of white sand that is closed to the general public. Not far from the villa is also found Pereybere Public Beach, one of the most scenic beaches in Mauritius.